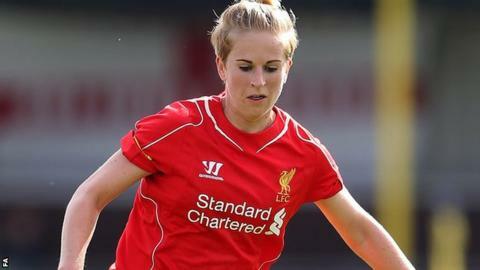 A Natasha Dowie winner gave debutants Liverpool a 2-1 advantage to take into the away leg of their Champions League last-32 tie against Sweden's Linkoping. Dowie's 73rd-minute goal at the far post sealed victory after Gemma Davison's early opener was cancelled out by Kristine Minde's 12-yard shot. "We grew into the game and in the end we got our reward," Reds manager Matt Beard said. The second leg in Sweden is on Thursday, 16 October. "Bearing in mind it was the club's first ever Champions League game, I felt that we proved we can compete at this level and all credit to the players," Beard added. "We've learned a lot as a group from this game and we can now definitely go into the second leg full of confidence." Striker Davison fired Liverpool ahead in the 14th minute with a deflected 20-yard drive following an Amanda da Costa corner. Linkoping hit back immediately and only a tremendous point-blank save by Reds goalkeeper Libby Stout prevented winger Minde from equalising. But the visitors began to dominate possession and drew level when Minde stole in behind the defence to slide in a shot eight minutes before the break. An evenly contested second half burst into life after the hour when Liverpool substitute Nicole Rolser sent an angled drive against the crossbar. Soon after, the Reds regained the lead as striker Dowie turned a Lucy Bronze cross in at the far post. Beard's side then played the game out comfortably to put themselves into a good position heading into the second leg. It was not a good day for fellow British side Glasgow City, who were beaten 2-0 by Medyk Konin in the first leg of their tie in Poland. Bristol Academy travel to Dublin-based Raheny United on Thursday.